Au début, pardonnez mon français, il y a probablement des fautes. J'ai créé l'écriture de la vigne uniquement à écrire français. Il exprime élision et liaison plus bien que latin. Ceci étais le but principal, et pense que j'aie ce fait bien. En case de liaison, une ligne longue représente un espace, sinon il est un espace vide. Il y a des caractères spécial pour les lettres élidé. La beauté de la écriture était un but secondaire. Je crois que j'aie réussi, mais je suis le créateur. To begin, pardon my French, there are probably errors. 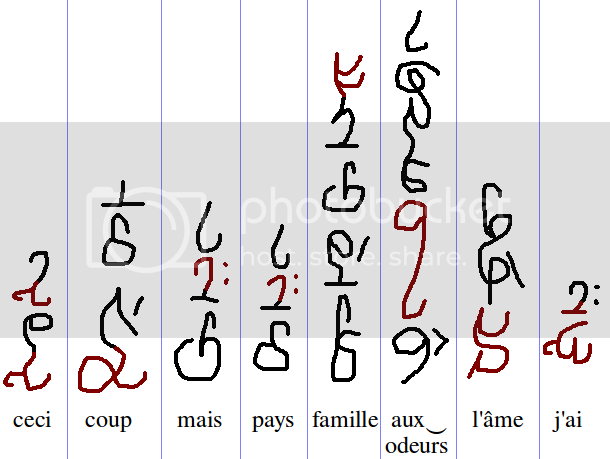 I created the writing of the vine uniquely to write French. It expresses elision and liaison better than Latin. This was the main purpose, and I think I did well. In case of liaison, a long line represents a space, otherwise it is empty space. There are special characters for elided letters. Making the language beautiful was a second goal. I think I succeeded, but I'm the creator. It reminds me a bit of Carsten Becker's Ayeri. But you haven't told us enough about it. a Semanto-Phonetic, logophonetic, morphophonemic, logographic or logosyllabic Writing System? (if so, does it use a Radical-and-Determiner system for many or most of its morphemes or words? And how much use does it make of Ideograms and of pictograms?)? 2. Is the writing direction of a word and a line: Top to Bottom, or Bottom to Top? Or, a kind of "vertical Boustrophedon", say the first line is top-to-bottom, the second bottom-to-top, the third top-to-bottom again, and so on, alternating t-to-b with b-to-t? 3. Is the placement direction of successive lines one after another: Right to Left, or Left to Right? 4. Assuming it's an alphabet, what are the sound values of each of its graphemes, and for each phoneme of French which grapheme of "Écriture de la vigne" represents that phoneme? 5. To what degree are the characters in "Écriture de la vigne" one-for-one replacements of the real-life characters used in writing French? If it's a very close match, what are the differences? a. Does it have uppercase (capital, majuscule) and lowercase (minuscule, (uncial?)) versions of the characters? b. Does it have a cursive form? Is its only form the cursive form? c. For which, if any, of its characters, does it have an initial form for use as the first "letter" of a word, different from the form used elsewhere? d. For which, if any, of its characters, does it have a final form for use as the last "letter" of a word, different from the form used elsewhere? e. For which, if any, of its characters, does it have an isolated or stand-alone form for use as the only "letter" of a one-letter word, different from the form used elsewhere? f. For which, if any, of its characters, does it have a medial form for use as an "internal" (neither first nor last) "letter" of a word, different from the form used elsewhere? g. To what degree, and how (if at all), do two consecutive characters affect each other's forms? Which pairs of characters show which kinds of effect? P.S. 7. What do the diacritical marks mean? Can we see the alphabet? I second (or third, whatever it is) the request for a key. Yee! Secondary mission accomplished, anyway, I was going to have a key and stuff up last night, but I accidentally closed the browser. Hurrah lists of questions, thanks Eldin Raigmore, I wasn't really sure what to say. 4. Here are the keys, I'll explain N., M. and * later. Sorry the keys are so sloppy, but I lost my scans and had to make them in kolourpaint. 5. The keys are given in terms of French letters, but they are more of a guideline. Ideally, the writing should match the phonetics of a Parisian accent. 6a. No, there is none. 6b. 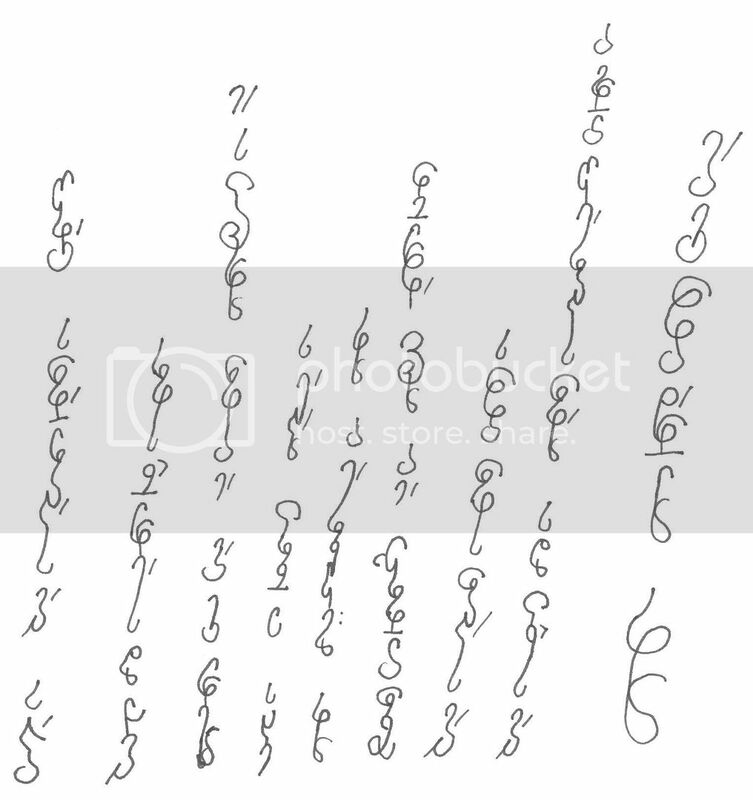 This is the cursive form and there is no print form, I think it's called. 6c,d,e,f. All characters have final and medial form. All consonants have an initial form. All consonants also have an isolated form, except *. 6g. The forms in of themselves mean something, so they cannot change other forms. 7. They're just accents to reuse vowels. Every consonant is listed with two values, N. and M. Normally, the N. value is meant, however, if the character is followed by *, it changes value to that in the M. row. All consonant must be connected to a vowel by proxy to make a sound, save for the isolated forms. However, no two vowels can be connected through proxy. The actual subdivisions are left up to the user as a matter of style, but are best used to represent division of the syllables. There are two symbols that are a matter of orthography, namely Ç and AI with a tréma. Ç sounds the same as Z* (S), however, it is used when there is a C with the value of /s/, e.g. ceci. G is always hard, and a soft G is still represented with Ç* (J). Similarly, a hard C, e.g. coup, is written as Q. AI with a tréma is used when É is written as AI or AY, e.g. mais and pays. A double L (ll) is written with an L, and another L swoop close besides it, e.g famille. Given the rule that consonants must connect to a vowel to make sound, one can place an initial form on the end of a word and not effect how it sounds. The advantage of this is liaison. Since vowels lack an initial form, ending initial characters automatically bond. This is shown with a long line between them e.g. aux odeurs. Elision uses the isolated consonant forms e.g. l'âme. If one needs to elide an M. row, use the isolated form, and the initial *, e.g. j'ai. Thank you! What other scripts do you have? What other scripts do you have? Well, I'm technically only at the intermediate level (or so the placement exam says. ), so my French will probably seem abominable to you. From what I can see you did nothing wrong.